Michael palmer is a good man, a family man. But honor and duty push him to leave his comfortable life and answer the call from Abraham Lincoln to fight for his country. This 'citizen soldier' learns quickly that war is more than the battle on the field. Long marches under extreme conditions, illness, and disillusionment challenge at every turn. Faith seems lost in a blur of smoke and blood ... and death. Michael's only desire is to kill as many Confederate soldiers as he can so he can go home. He coldly counts off the rebels that fall to his bullets. Until he is brought up short by a dying man holding up his Bible. It's in the heat of battle at Gettysburg and the solemn aftermath that Michael begins to understand the grave cost of the war upon his soul. Here the journey really begins as he searches for the man he was and the faith he once held so dearly. With the help of his beloved wife, Jesse Ann, he takes the final steps towards redemption and reconciliation. Using first-hand accounts of the 14th Connecticut Infantry, Karl Bacon has crafted a detailed, genuine and compelling novel on the 150th anniversary of the Civil War. Intensely personal and accurate to the times, culture, and tragedy of the Civil War, An Eye for Glory may change you in ways you could have never imagined as well. 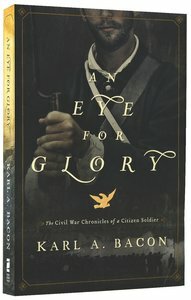 About "An Eye For Glory"
Karl Bacon is a first time novelist, but long time student of the Civil War. He and his wife, Jackie live in Naugatuck, Connecticut. Customer Reviews For "An Eye For Glory"
This a brilliantly written book! 'An Eye For Glory' is certainly a highly confronting description of humanity at it's very worst and it's very best. From the mentality that would have men mindlessly slaughtered by the thousand within the space of hours, to the portrait of Michael's best friend John (oh, for more John's in the world! ), the complete spectrum of human behaviour is perfectly illustrated within the pages of one book! As a Christian who has a passion for both fiction and non-fiction Christian literature, I thoroughly enjoyed the journey of Michael Palmer. How amazing God is in all circumstances, and what an encouragement this book is to cling to Him especially when death would be the more preferable option. I was buoyed by the conclusion that God may have used the horrors of war to refine Michael Palmer and expel the deeply held sin he didn't know was within him. How thankful we can be when we go through difficult circumstances, knowing God will be using such times to make us more like Christ. The writing of 'An Eye For Glory' must have been a labour of love and obedience, yet it is easy to see God's influence as one reads through. I was thoroughly sickened and horrified by the war scenes painted throughout, and knowing that they are based on first-hand accounts and historical records makes it all the more unfathomable that such evil could ever have occurred. However, paralleling the story of violence and misery, was the warm blanket of God's unfailing presence, His love, and all the desperate hope King David speaks of in Psalm 40. How well that balanced the horror. I have read many Christian novels based on the reality of modern warfare in Afghanistan and the Middle East, however this was the first historical war novel I have read, and it paints a very different picture, despite the fact that people have changed very little. I have given copies of this book to non-Christian family members, as the war story will certainly capture their attention, and this presents a perfect opportunity to pair the beautifully written truths of the Bible with the struggles and tragedies. God has certainly used the talent He has given Karl Bacon to gently, yet uncompromisingly, bear witness to His sovereignty and His love. The word 'bl--dy' was used a couple of times near the beginning of the book, but no other bad language was used. I received this book and liked what I read except there is alot of swearing that Aussies my find offensive. The word is fine in America (I have had a discussion with many to see) but in Australia is not a word I want to read, so therefore haven't read more of the book, as I found the language a problem. I was really looking forward to this book as I am fascinated with the civil war but unless the English officer had died in the first few chapters I knew the language would continue.